If you’re planning to go on a road trip or a camping adventure but your vehicle is not spacious enough to hold all your things, the Keeper 07203 Waterproof Roof Top Cargo Bag will answer your needs. 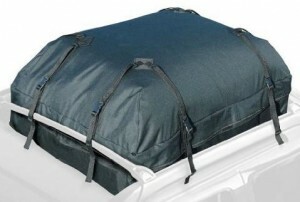 It offers 15 cubic feet of space and a waterproof design that shields your cargo from harsh weather elements and dirt. This cargo bag has soft sides, making it easy for you to pack even the most oddly shaped items. When not in use, this cargo bag folds down to a compact size for easy storage. Even if your driver has a penchant for speed, you can be confident that this cargo bag will not fall of the roof, thanks to its strong cam buckle straps. There are 234 customer reviews for this product on Amazon.com. A large chunk of reviews are positive, with most customers saying that this cargo bag is truly durable and worth the price. Not exactly waterproof – Some customers were disappointed to find that some of their belongings have gotten soaked after driving through heavy rains. Reviewers say that the product’s waterproof claim only holds true when rains are light, but using it during a heavy downpour is not advisable. Straps break easily – A number of reviewers have also complained that the straps on the cargo bag don’t seem very sturdy. One customer even suspects that the straps were simply just glued to the bag—which explains why they come off quite easily. Durable – Customers appreciated the high quality material of the bag. It feels tough and they feel confident that it could hold a lot of stuff without breaking or tearing. Plenty of space – It may look a bit small out of the box, but reviewers were delighted to discover that this bag is more spacious than it appears. It can carry several items—even bulky ones. You could fit two duffel bags in it and still have room for more things. Weatherproof – Contrary to what other people have said about the product, many customers claim that this cargo bag is indeed waterproof. Not only did it keep their things dry during heavy rains, but the bag held up well during heavy winter too. While the Keeper 07203 has some flaws (flimsy straps and leaking), these problems are rather minor and could easily be remedied by using sturdier ropes to attach the bag to the car and by covering belongings with plastic bags to keep them from getting wet. Overall, the Keeper 07203 delivers where it really matters—providing you with more space and protecting your things from dirt and most weather elements.